During my senior year of high school, I was finally allowed to drive somewhere out of town. I had to ask permission of my parents/beg them to allow me. Where was the destination of this adventure? 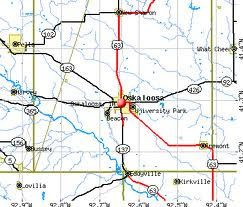 Oskaloosa - literally one county north. The purpose of the trip was to watch a cross-country match. Well, it was even less cool than that, it was a JV cross-country match. Just going from memory, I think Ian Kenning and Shawn Neary tried out for cross-country our senior year and made the JV team . . . maybe Erin Alberty too. Why? I have no idea, other than I would guess that they had a fairly light acedemic year (a lot of my piers and I had a light senior year) and just wanted one last chance at a different experience. Why not. So I went with a couple of my slightly younger peers -- my "sophomore friends." I do not remember which ones. I would be inclined to say Charlie Knight and Brad Williams . . . but I dunno. The track meet was really boring. But what an amazing drive!! !